Apple's revenue for the third quarter of the fiscal year 2018 hit $53.3 billion, the company revealed on Tuesday, with it and the earnings-per-share of $2.34 growing year-on-year, and iPhone sales of 41.3 million units. 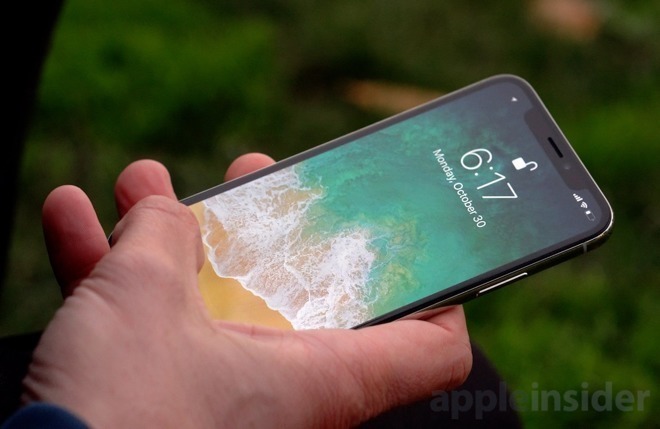 Apple shipped 41.3 million iPhones during the June quarter, up slightly year-on-year from the same period in 2017, when it shipped 41 million iPhones. Revenue from iPhones of $29.9 billion is up year-on-year by 20 percent from $24.8 billion. "We're thrilled to report Apple's best June quarter ever, and our fourth consecutive quarter of double-digit revenue growth," said Apple CEO Tim Cook. "Our Q3 results were driven by continued strong sales of iPhone, Services and Wearables, and we are very excited about the products and services in our pipeline." The average selling price (ASP) of the iPhone is $724.12, up from the $605.62 ASP from one year ago. This continues a pattern seen in earlier quarters, with the main ASP driver being the premium pricing of the iPhone X, higher than the second quarter's ASP of $728.35 but down from the $796.42 from the first quarter. Analyst predicted Apple would sell around 42.05 million iPhones in the third quarter, forecasting a range between 39.8 million and 43.3 million. The iPad earned Apple $4.74 billion in revenue for the quarter, down year-on-year 4.6 percent from last year's $4.97 billion, with sales of 11.6 million units growing 1 percent from 11.4 million units from the same period last year. The results failed to meet analyst estimates of around 11.8 million units shipped. The period is also the first full quarter the 2018 iPad with Apple Pencil support has been on sale, with the revision not making a major impact on sales, but rather maintaining the level. 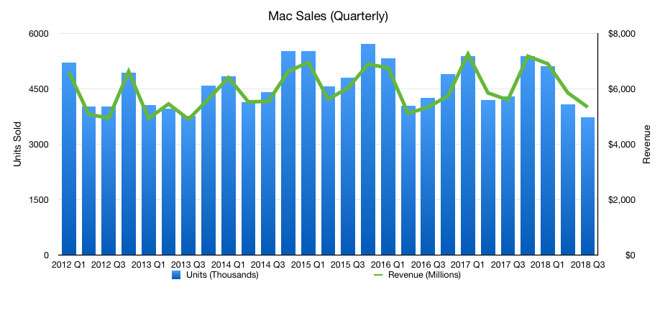 Mac revenue of $5.3 billion for the quarter is 4.7 percent lower than one year ago's $5.6 billion. Sales of 3.7 million units are a decrease from the 4.3 million recorded last year. While Apple did recently refresh the MacBook Pro lineup, it will not have affected the reported period's figures, and it is unclear if it will make considerable changes to the next quarter's numbers. The Services arm of the company is still growing, contributing $9.6 billion in revenue and a yearly increase of 31 percent from the $7.3 billion reported for the period in 2017. Services continues to report double-digit year-on-year growth, making the last quarter the 13th consecutive quarter to do so, and keeping it a relatively predictable revenue source for the company. Overall revenue in the quarter of $53.3 billion is a year-on-year increase of 17 percent from $45.4 billion, with the earnings per share (EPS) of $2.34 up year-on-year. 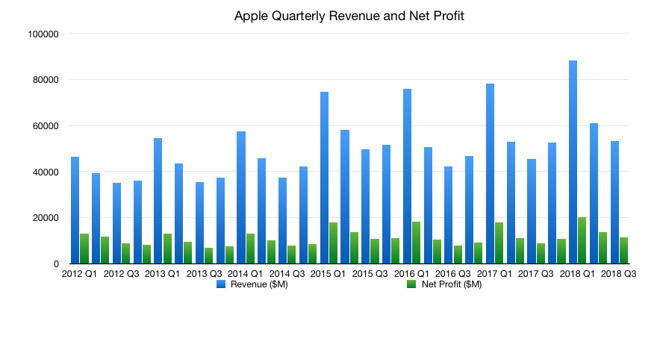 Last quarter, Apple forecast revenue between $51.5 billion and $53.5 billion, with a gross margin between 38 and 38.5 percent. Apple is forecasting revenue between $60 billion and $62 billion with a gross margin between 38 percent and 38.5 percent for the coming fiscal fourth quarter. Operating expenses for the period are expected to land between $7.95 billion and $8.05 billion, while the company anticipates a tax rate of about 15 percent.